← So why haven’t I been posting? I have feverishly been preparing for honey extraction this weekend. Coordinating my work schedule with the weather is normally my biggest concern. Luckily I think I will have all of the honey supers pulled before the remnants of Hurricane Isaac reach the area. It’s going to be a rainy weekend, might as well spend it inside extracting honey. This is the form of escape board that I use. When being used the side with the triangle and screen on it is DOWN. I have seen several different methods for getting bees out of my honey supers. The method I decided on was the use of escape boards. As with everything in beekeeping different people have different opinions on clearing their bees from honey supers. I settled on this method several years ago because it doesn’t require chemicals and I have too many supers out to remove every frame at extraction time. I visit the hives 24-48 hours prior to pulling the supers. At that time I remove the lid and inner cover. I then remove the supers that are to be harvested. 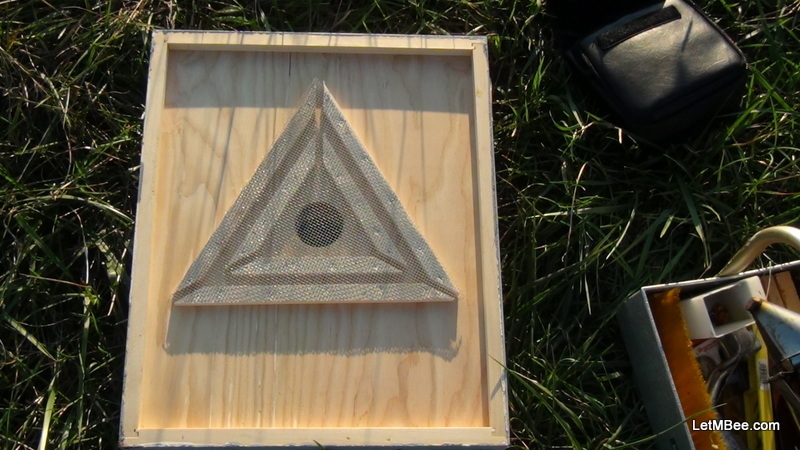 The escape board is then placed atop what remains of the hive WITH THE TRIANGLE SIDE DOWN. Afterwards I restore the the super(s) as well as the inner and out cover to their original positions. The trickiest part of the whole exercise is getting the supers back on top without moving the escape board out of position. The boards are light and are not used enough to be tacky from a layer of propolis. While doing all of this you must take note of your equipment. If there are any places where the bees can sneak into a bad corner or some other crevice above the board the escape will do you no good. I carry a roll of duct tape with me any time I am working bees, but this is the time of year it sees the most use. After 24-48 hours there normally will be fewer than 50 bees remaining above the escape board. When I pull the supers I move them a short distance away and use a leaf blower to remove the remaining bees. Some may find the leaf blower barbaric, but it does remove them effectively and they usually fly right back to the hive. It is the best method I have currently, but would be open to suggestions if anyone has a better idea. One key thing to remember. After the honey supers are removed you still have your escape board on top of the hives. Make sure you get those supers either out of the area or covered (bee proof) prior to removing the escape boards. There will be hundreds if not thousands of bees on the bottom of the board attempting to access the supers. When you remove the board many of them will fly. Remove your escape and move it a short distance from the hive. It will not take long for the bees to find their way home. Then place your inner and outer cover back on the hive. Today is going to be beautiful here and I have to visit 10 hives that are in various stages of this process. I need to get going. Do you have any questions? Comments? This entry was posted in Honey and tagged bee, beekeeping, escape board, Indiana Beekeeping, Jason Bruns. Bookmark the permalink. I went with escape boards too, Mine are square but the same principal, when I tried them last year they didn’t work (tried on one hive), when I went to harvest I realized the broodnest was in the top box that I was trying to harvest, no wonder it wouldn’t empty (I don’t use excluders). This year is different I know the nest isn’t up top so it should work, that time of year I guess. I used them for the first time last year. I think they work great. The only problem is I don’t have enough of them. Proceeds from honey sales this year must go to the acquisition of more boards. I figure I need at least 1 for every two production hives if I want to be able to get all of my honey pulled in a timely manner (either that or win the lottery so I don’t need a job). As long as the brood nest is below I have had great luck with them. I spun out some supers for a friend last weekend. I went to pull two frames apart and a marked queen came crawling out. He had pulled a super with brood in it as well and the queen was still up in there! In his defense it was his first year, and I wish I would have had time to go help him evaluate the boxes. I don’t use excluders either. When visiting the hives to put the boards on I will pull the frames on supers to assure that everything is capped and ready to go. I have 3 hives that have some brood up in the honey supers. Normally for some reason my supers tend to get little patches of drone brood in them as opposed to any worker. I “think” this may be due to the cells getting damaged when uncapping, but I am not for sure. It makes it easy to spot looking down through the supers. If I see bullets I will leave it on there. Another oddity this year….. I had drone brood in areas with capped honey around and below it. This year was the first I had seen that. Thanks for reading Sam and check back in.